The dedicated crowds were packed in to a very warm sports centre for what now seems to be one of the favourite fixtures of Roses: Basketball. 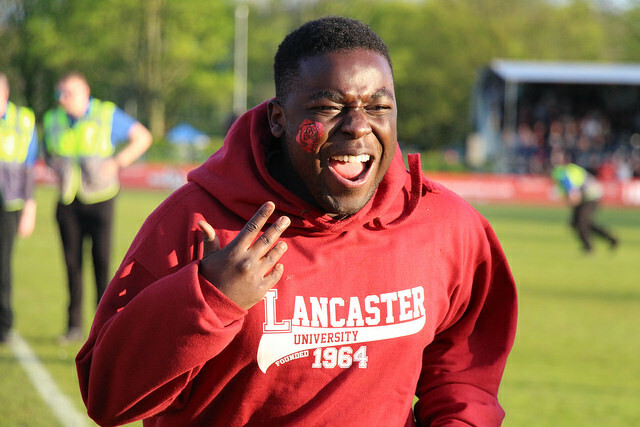 For those that missed it last year, the men’s game was the fixture of the opening ceremony, seeing last year’s visitors, Lancaster, throw away a narrow lead in the final quarter of the game. Would they suffer similar fortunes on home soil? York started strongly, opening the scoring thanks to some slick movement down the left-hand side. As the quarter progressed, Lancaster were able to pull ahead leading 17-9 at the end of the first quarter. As the second quarter got underway, Lancaster began to pull ahead, including an incredible backwards throw, with York really beginning to suffer from missed chances earlier in the game. With just 2:16 left of the quarter, Lancaster were looking strong leading York 31-20. However, this was the point at which the game began to turn for the home side. York mounted a comeback in the dying minutes of the quarter. Half time saw the score line at 31-24, with Lancaster’s grip on their advantage beginning to slip. As the third quarter got underway, play was fluid and end to end. Lancaster were still just seven points ahead going in to the final quarter. The fluidity of play was definitely on the wane as the game ended. One player for each side began to particular stand out here; York’s 23 seemed to be winning a lot of free throws, but also scoring them. Lancaster’s number 6, though the smallest player on the court, was giving York the run around. Ultimately, York’s sudden run of free throws lead to a narrowing of the points; with 2:30 left to go the score was at 55-49 to the home team. The final minutes consisted of end to end play, with the gap narrowing to just three points. Were Lancaster going to hold on, or were they in for a repeat of last year? It was good news for the home team as they sealed the win by capitalising on a free throw with less than 20 seconds on the clock taking the final score to 61-55.